So what do you get a guy for Valentine’s Day? 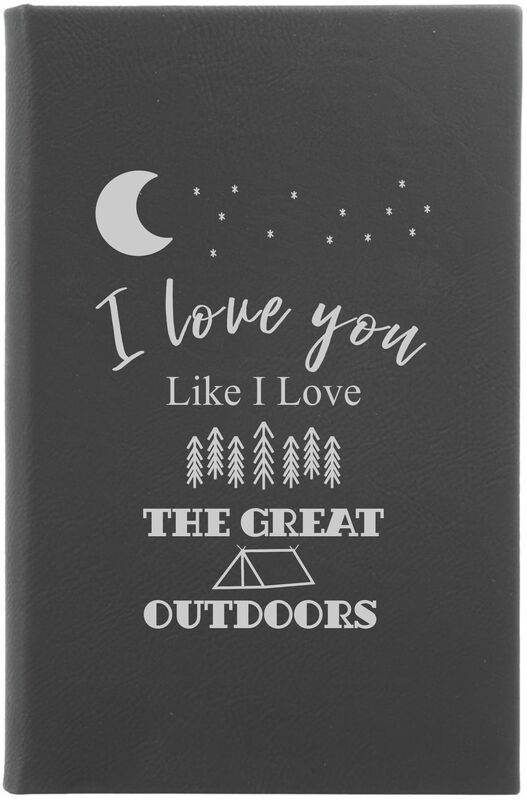 What kind of unique and great Valentine’s day gift can you give him that will be kept for years, and will make him smile not only when you give it to him, but every time he sees it years later? Hint: It is not a tie and it is not socks! The best kind of Valentine’s Day gift for a guy is something useful – something he’ll keep in his pocket for years and use often. Think of a pocket knife, multi tool, lighter or nice key chain. 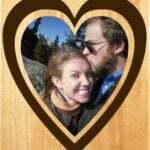 What is the best way to ensure guys never forget the emotion behind the Valentine’s Day gift? Personalize it with their name or initials! And maybe a meaningful date. But keep it simple. If your man has a desk job, consider something that will make him smile at his desk. Another tip: even though you are giving your gift at or around Valentine’s day doesn’t mean it has to say “love” on it, be covered in pink hearts or be red. Most guys would prefer it not be pink and covered in hearts, in truth. When they see it, they’ll remember the meaning behind it. Humans, even guys, don’t forget the emotion behind a gift. 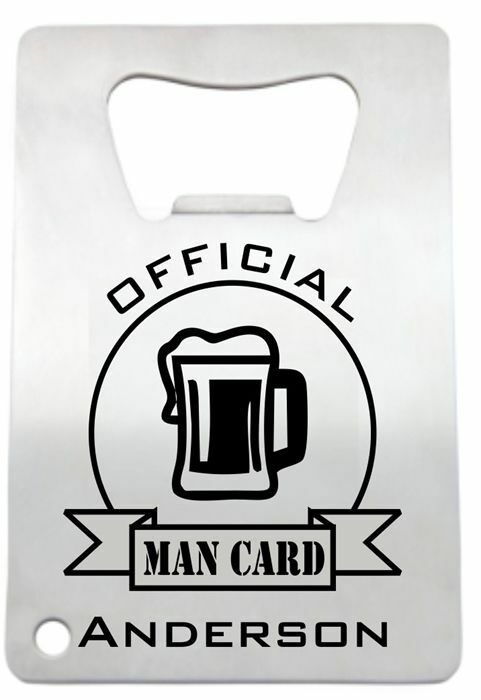 Ready to shop for the guy in your life? Let’s get started! Pocket knives – the most popular gift for guys any time of the year, and also at Valetine’s Day, for a reason. We guys love getting new knives. It doesn’t seem to matter how many I already have, I love getting another slightly different variation. Rescue knife style, wood handled, tactical… so many options. Start here. What to engrave? Consider your combined initials (J+A) or his last name. 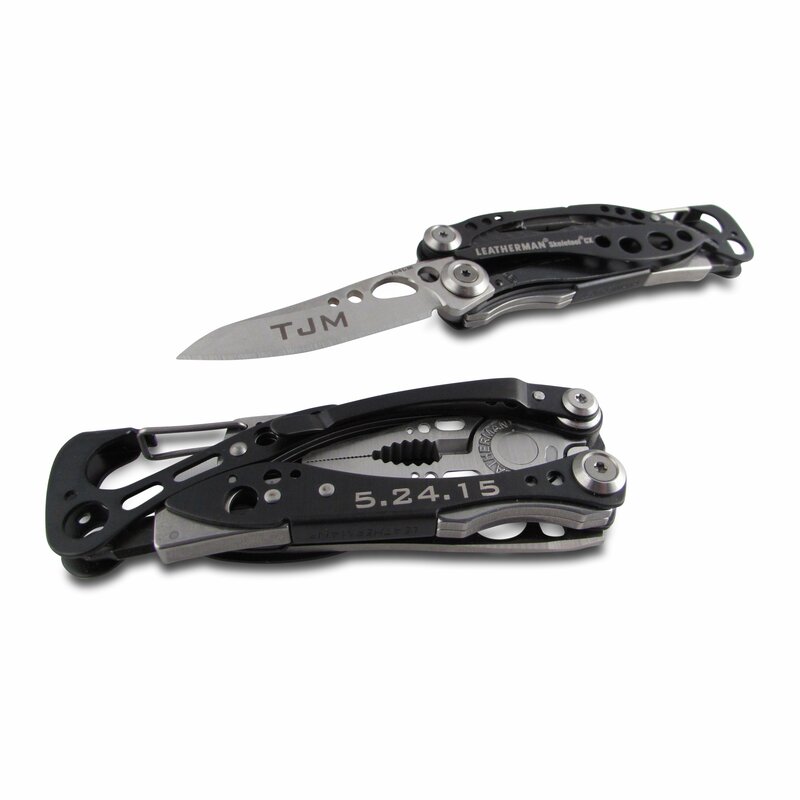 He’ll never forget who gave it to him, so make the gift about him – put the guys name on his knife. 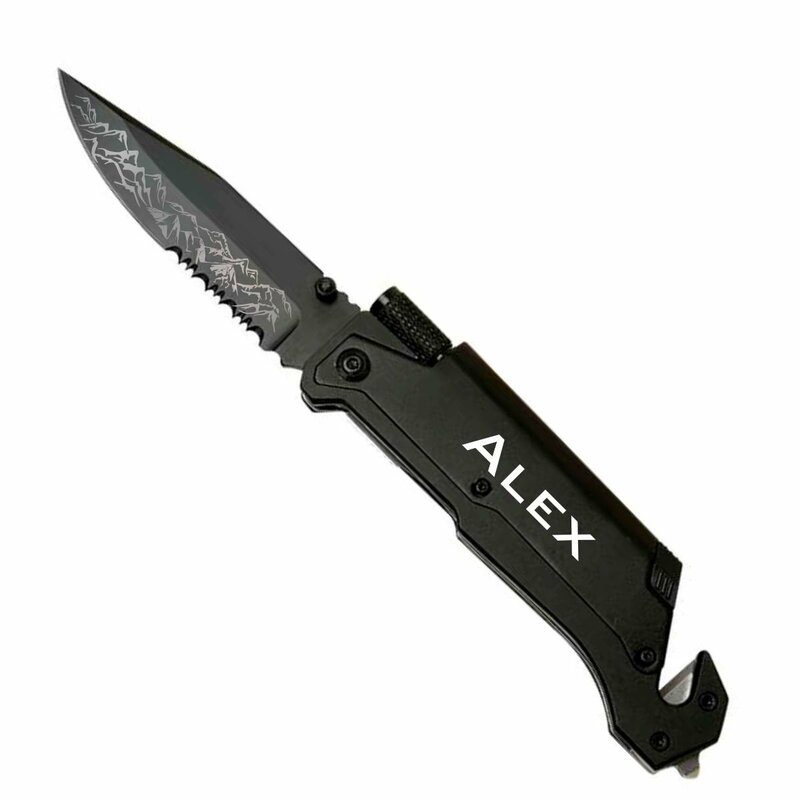 Trust me, I’m way more likely to show off my knife to other guys if it has my name on it. 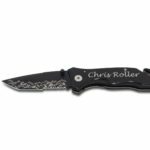 Put a special message on the blade if you have something romantic you want to engrave, and his name or initials on the handle. A handy multi tool is the perfect guy gift – and some are small enough to clip inside their pocket. They’ll always be prepared and ready to help a damsel in distress with a Leatherman tool at their side. Find the right guy multi tool here. 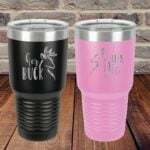 Shine a light on your relationship with a super bright, customized flashlight! 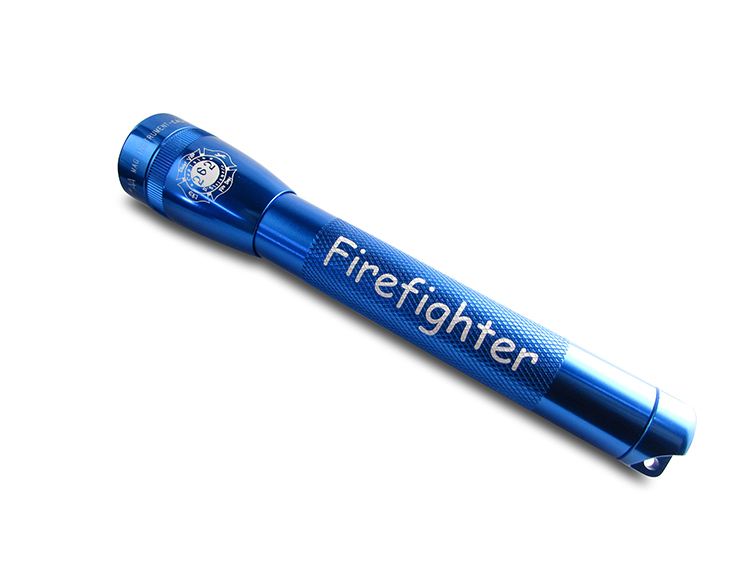 A quality flashlight will be kept for years, if not decades, and used often. Pick the right light for any guy here. What to engrave? Your combined names or initials, a special message or key dates. Lots of fun puns available, “you light up my life,” “you light me up,” etc. Journals, notebooks and portfolios give a man a way to jot down his thoughts and work effectively. Start writing here. What to engrave? See our fun designs, or create your own. 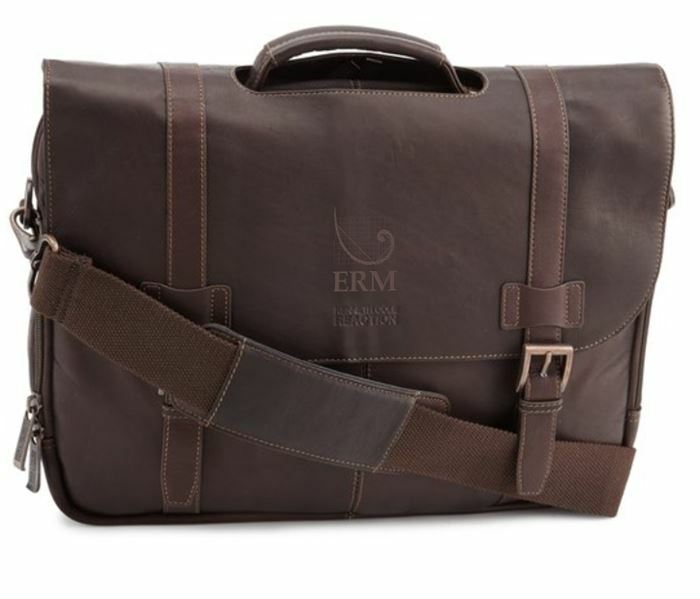 Or keep it simple and professional, with the guys initials in bottom right corner. 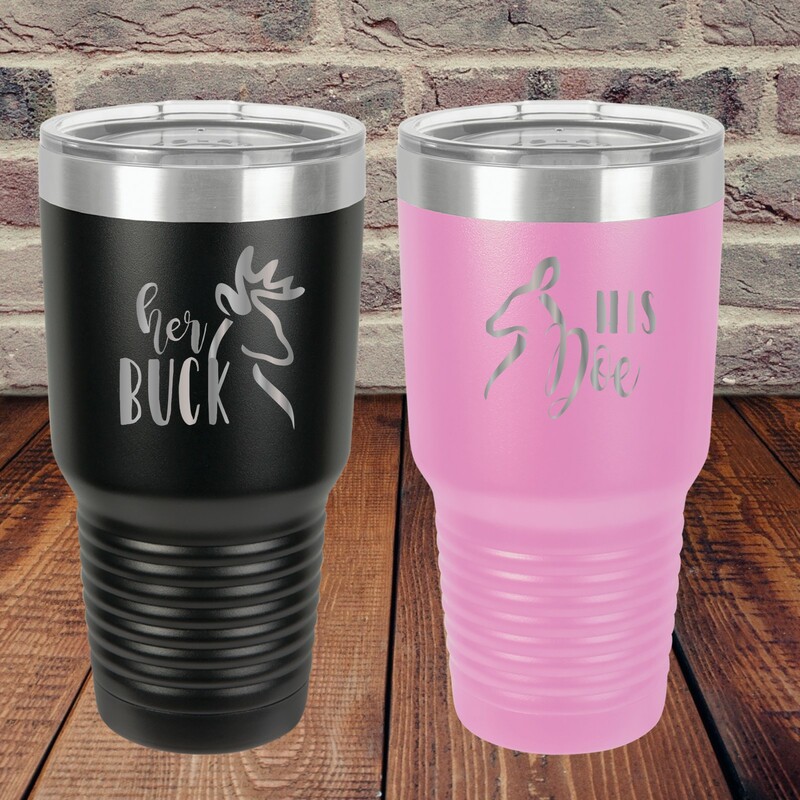 Personalized travel tumblers, mugs or thermos bottles are a great way to travel with him when you are not there. 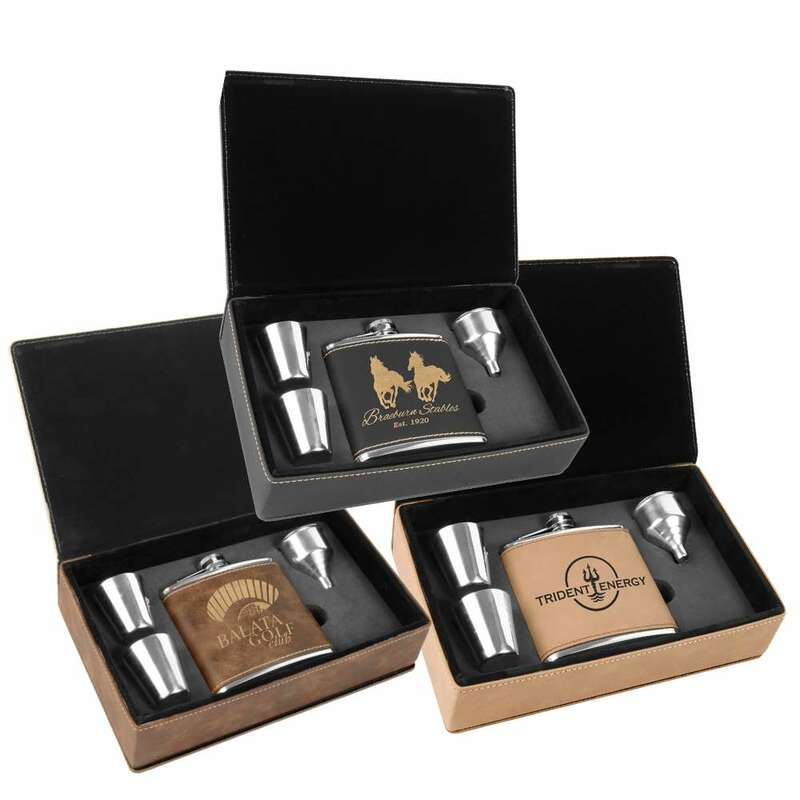 Choose from fun designs or engrave your own message. Get him hydrated here. 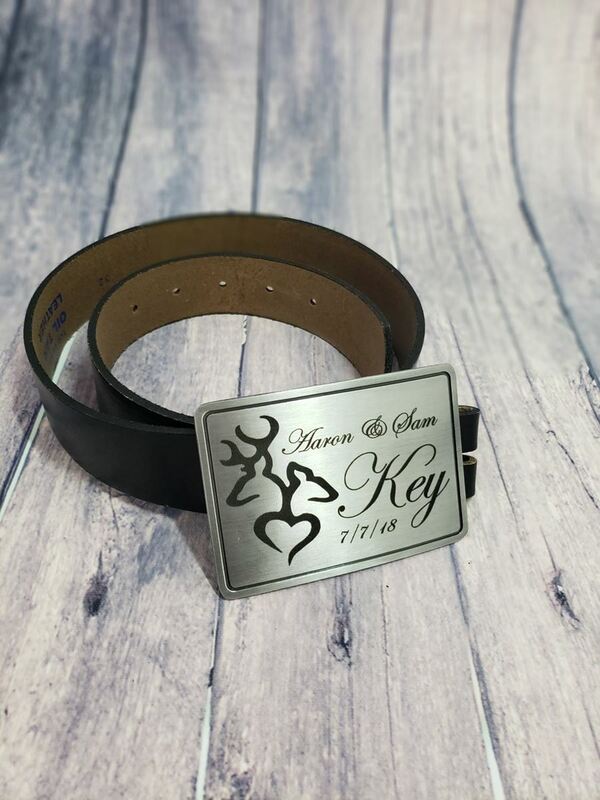 Customized belt buckles are a fun and lasting gift, always kept in the same spot, used for years. Find the right buckle for him here. What to engrave? Logos, clipart, favorite quotes or important dates. Bottle openers, especially when personalized with his initials, are a fun useful gift. Find the right opener here. What to engrave? Initials, names, dates. 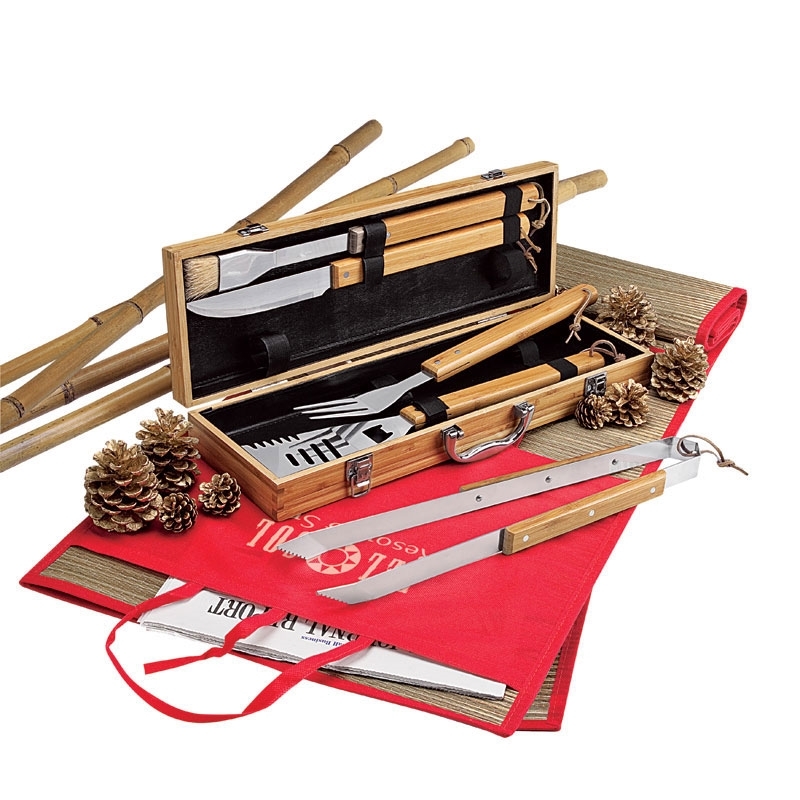 Whether a premium 5 piece bamboo BBQ tool set, or a fun spatula, or a tactical apron, we’ve got your grill master gifts covered! Find the right one here. What to engrave? 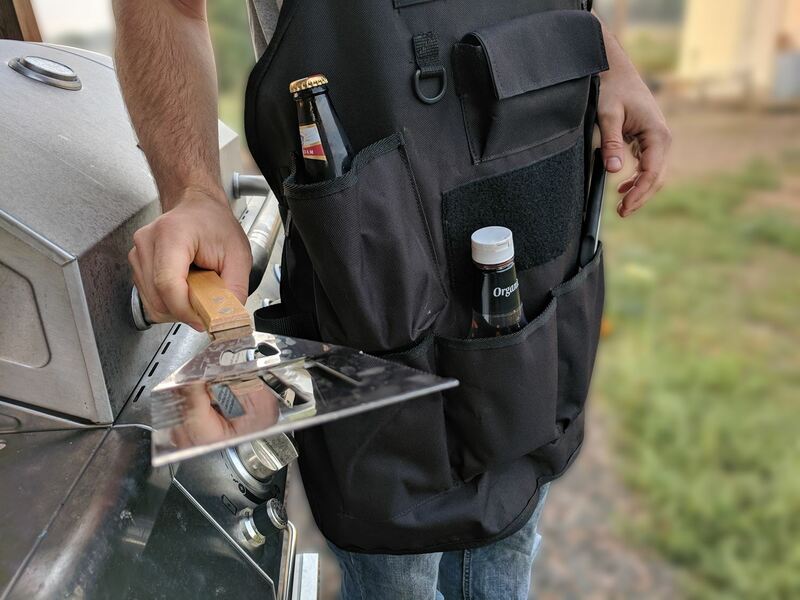 Initials, last name, Grill Master, fun quotes about grilling. For the man at the office, a nice gift reminding him of a loved one is super fun. 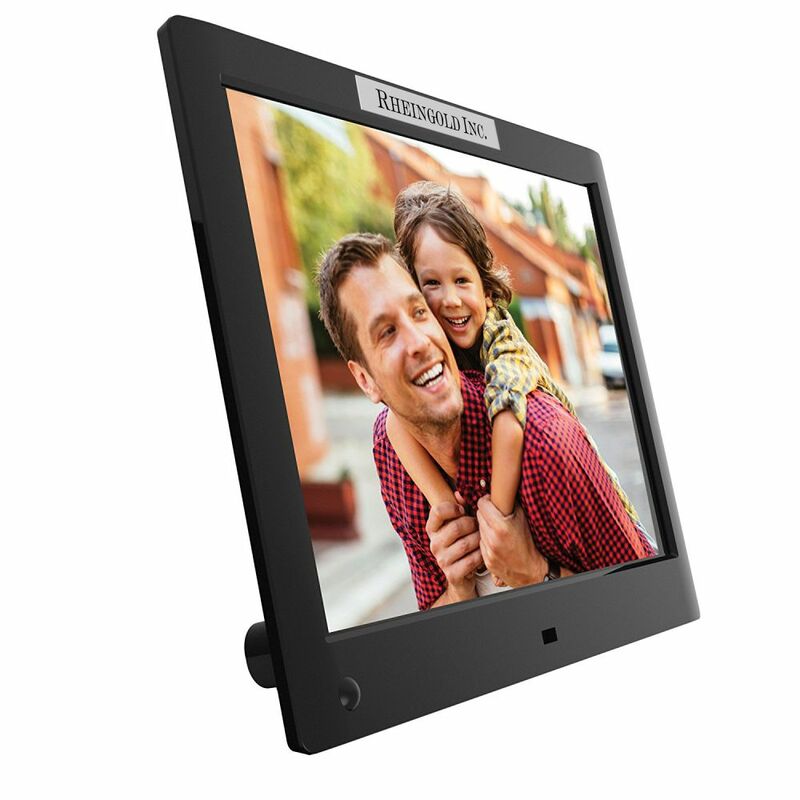 Whether it be a digital picture frame, a nice pen, a desk name bar, electronics, for your husband or boyfriend, get your office dweller the perfect gift here. Still need gift ideas? Check out our ultimate Valentine’s day gift guide!